This is my first iOS App review for MusTech.net, and I have started with what I think is the most beautiful music app I have ever seen, The Orchestra. Created by an amazing team of partners including TouchPress, The Philharmonia Orchestra under the direction of Esa-Pekka Salonen, The Music Sales Group, and Rite Digital; The Orchestra is an absolutely beautiful app that takes the user into the world of the symphony orchestra in a new, refreshing, and completely interactive way. 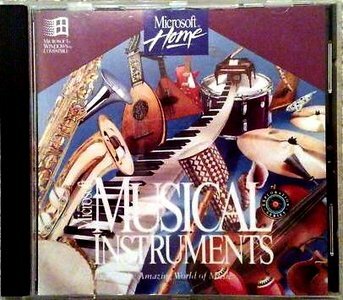 For those of us who can remember the amazing software titles Microsoft Musical Instruments and Sibelius Instruments, both now incompatible with current computer operating systems, there has been a dearth of resources for music teachers looking to show their students the instruments of the orchestra in an engaging manner leading many to create their own resources using a combination of YouTube videos and Google search results. The Orchestra is the perfect follow up to these software titles for any music teacher with access to an iPad or an iPhone 4, 4S or 5. At $13.99 it’s one of the more expensive apps, but I’d like to remind everyone what we used to pay for a CD-ROM and that when put into context, the price point is a BARGAIN for what you get in return. I happily paid the $13.99 and had to clear up some room to install the app on my iPad 2 (you need to have 2GB available to download it). After a few minutes of waiting for the app to download, I opened it and instantly felt my jaw drop. It is quite simply, beautiful. Once you have opened the app, you have two main options: experience one of eight fully interactive musical scores, or explore the instruments and sections of the orchestra. Let’s start with the interactive scores. The app includes the full scores, complete with video of the performance with Esa-Pekka Salonen conducting, of the following pieces: Symphony No. 6 by Haydn, Symphony No. 5 by Beethoven, Symphonie Fantastique by Berlioz, Prélude å l’aprés-midi d’un faune by Debussy, Symphony No. 6 by Mahler, The Firebird by Stravinsky, Concerto for Orchestra by Lutoslawski, and Salonen’s Violin Concerto. It is a veritable tour through the various eras of orchestral repertoire. I first opened The Firebird by Stravinsky. I was immediately presented with a full score (that has some amazing viewing options, including a “curated score” view that provides a condensed version (each score scrolls along with the recording complete with an instrument icon to help you keep track of who is playing what) and a score view similar to piano roll notation (wonderful for those who don’t read music). Above the scrolling score is a video (from three different angles) of the Philharmonia Orchestra performing the work. Beneath the video playback window is an option to turn on “commentaries” which include the conductor’s commentary (Salonen speaks about conducting the score while it plays back) and a musician’s commentary (which features several musicians from the orchestra providing insight on what it is like to perform the work). For someone like myself who loves the director’s commentary on films, this is an amazing feature. You can also read program notes about each piece by clicking on the book icon. One of the most wonderful hidden features of the scrolling scores is that the user can simply touch the score and pull it back to replay a certain section over. The video also scrubs along. It is a wonderful feature. All of the other masterworks featured use the same interface and functionality. Knowing how much the production costs must have been (or at least being able to guesstimate), it is nothing less than extraordinary to see this content so well done. The partners who created this app spared no expense in providing users with the most intimate orchestral experience possible with an app or any software platform for that matter. 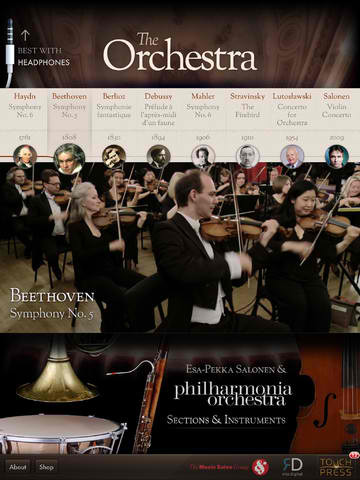 Exploring the Instruments and Sections of the orchestra is another fantastic feature of the app. From the Home screen, clicking on Sections & Instruments brings you to a wonderful page with spinning pictures of each instrument featured in an orchestra. A tuba player originally, I clicked on the tuba to see what I’d find. I was extremely impressed. You are presented with a page featuring an interactive picture of a tuba (that you can spin around with your finger to see all angles); a video of Andrew Cresci speaking about and demonstrating the tuba; a text section that provides some basic information about the tuba; a section called Did You Know? with some interesting facts about the tuba; two excerpts from the included repertoire with video footage focusing on the tuba; and an interactive keyboard that allows you to explore the range and sounds of the tuba by playing the keyboard with your finger. It is simply awesome. Every other instrument, as well as the conductor, have the same content provided. Very well thought out, designed, and executed. For a music teacher with an iPad, and some method of projecting the iPad on to a screen, The Orchestra is a must-have app – at the very top of my list. I am simply blown away by the content and the resources provided for music educators to make the orchestra come alive for their students. I urge you to purchase the app for yourself and share it with your students. If your school has a 1-to-1 iPad program, get your administrator to put this on the holiday wish-list. If you get some iTunes gift cards from your students this holiday, buy the app. I have not tried it out on an iPhone yet, but I am sure that it looks just as beautiful. I’d love to hear from those of you who have it for iPhone.